During a routine service, my LBS noticed that my rear tyre was shredded and blistered, such that the outer rubber layer had come right off in places. From the photos it's hard to imagine that I hadn't noticed the dreadful state of the tyre whilst riding, and it's astonishing that I've never had a puncture on either front or rear tyre. I virtually never skid, but my LBS guy reckoned they looked like heat blisters. Both front and rear tyres are Specialized Armadillo 700x25c, put on my Giant SCR 1.0 at the same time, around 2 years ago. They'll have done four or five thousand miles, which is respectable for a decent tyre. The fact that the tyre has worn out isn't surprising; the front tyre has a lot of life left in it, but rear tyres get a lot more wear because of the constant driving friction they're exposed to. What is bizarre is the way that the outer rubber has just lifted off, revealing the tough webbing underneath. I've never seen this before, and my LBS guy thought it was very odd - possibly a manufacturing defect. Given how many miles the tyre's done, and that it still hadn't punctured, I think 'defect' is a bit harsh. 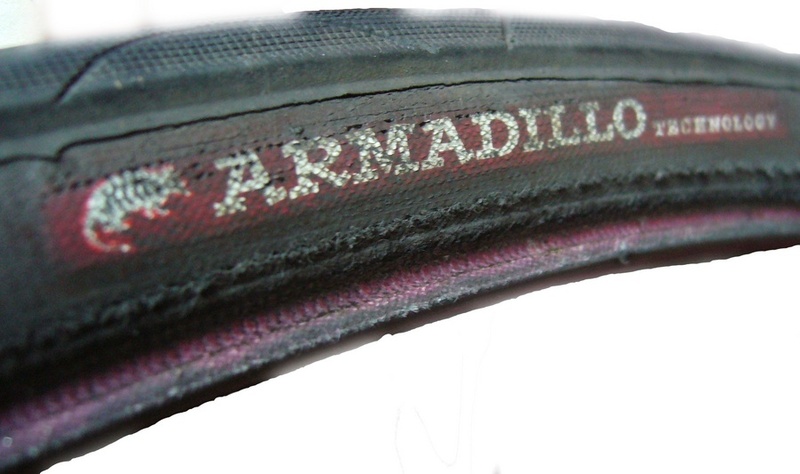 This has certainly not put me off buying Armadillo tyres; in fact, quite the opposite. They're super tough and seem to be simply puncture-proof. Yeah the same happened to mine. Like you I don't skid, just commuting every day is what I do. The last set I had just wore and got glass cuts in, as one would expect. They didn't disintegrate like this. Trying a different make this time.